Published on March 28, 2012 April 22, 2012 by cara.b.b. warning, this is healthy, but honestly, i think it’s so full of flavor that you might not notice. it requires a small amount of cooking, but it’s only about 5 minutes. heat a pan on medium. once hot, add olive oil, spinach, and water. cover and cook for about 5 minutes until the spinach is fully wilted, stirring a few times along the way. after the spinach is done cooking, add lemon juice, salt, pepper, and cayenne and cook for another minute or two uncovered. 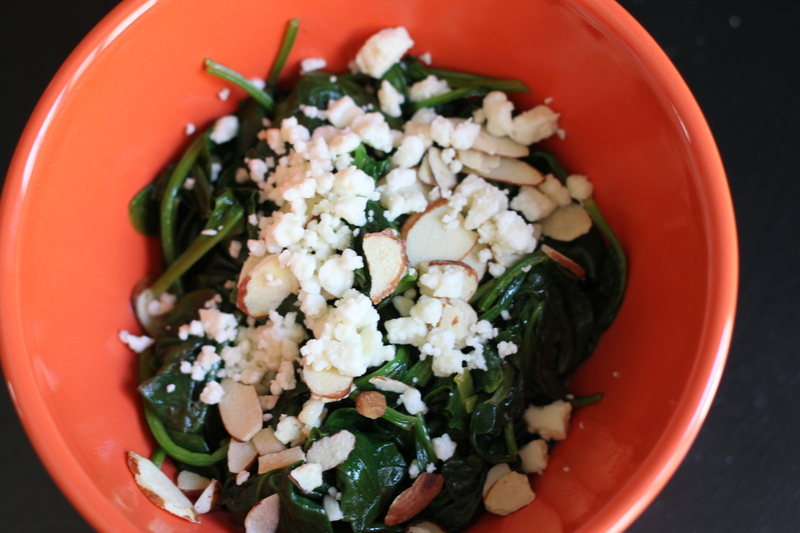 plate the spinach, and add a sprinkle of sliced almonds and feta cheese. yum! pair it with a hunk of chicken or whatever you fancy. today, i paired it with some leftover sweet potatoes and i was a very happy camper. and now, i can eat my body weight in chips and salsa tonight at chicas’ night out. you gotta pick your battles, right? Yum! Some of my favorite ingredients, all in one.